I’ll admit I should not be reviewing dance, I don’t understand it. I don’t understand the language or technique behind any of it. 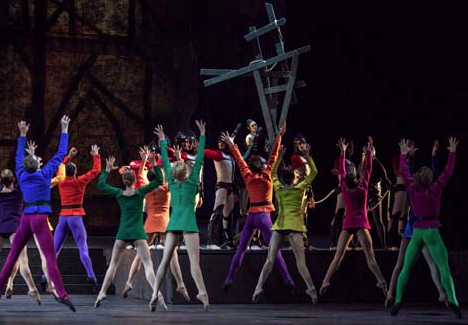 That being said I understand that Roland Petit was going for a more experimental form of ballet with Notre Dame de Paris or contemporary ballet. Contemporary ballet uses both elements of traditional ballet and modern dance to create a new style of ballet. The style on dance in this ballet is not light and graceful with impressive delicate footwork on pointe, this ballet feels more masculine in its energy and movements than traditional ballets. It feels powerful in its moves and there is a lot more upper body movements than you would see in what is considered for a conventional ballet. That’s not to say it’s all strong manly ballet all throughout. Esmeralda does go on pointe and has more conventional ballet fluidity in her dances but their the modern dance elements still there. Like during her solo she has these sliding motions with her feet across the floor, which I have never seen in a ballet movement, though I could 100% mistaken and it done in traditional ballet. The question is does this contemporary ballet style of Petit’s work for the story? Hugo always had a rough less genital setting to his characters and story. With Hunchback we have a tragic story of three men and their own unique takes on love and desire. So while I personally don’t understand this style of dance or ballet, it does suit the mood of the story. There is nothing wrong with the choreography, Petit approached this project with a lot of passion and knowledge of the art form. This is all super subjective either you like this style or you do not. Or you’re like me whereas you appreciate the intent but you really just don’t get it. There were moments I liked, Like Esmeralda’s first solo, the pas de trois with Esmeralda, Phoebus and Frollo and the pas de deux with Quasimodo and Esmeralda in the second act. I also really liked Quasimodo’s moments on the whole of how the dancer uses his arm and elbow as his hunch. Make it more interactive.